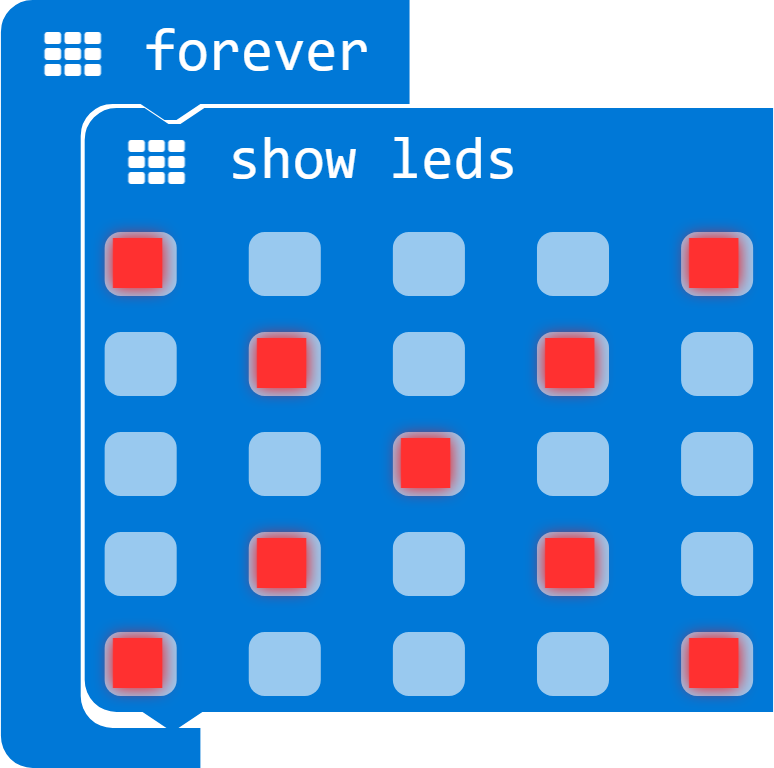 The micro:bit has a 5 x 5 LED matrix built in. You can light up multiple LEDs to make patterns or scroll text and you can easily display basic images. You can light up the individual LEDs if you want and also set the overall brightness of them as well. In the blocks editor open the Basic tab and drag a forever block into the code window, now drag a show leds block and position it inside the forever block you position earlier. Click on the LEDs in the show leds block and choose a selection, you can see this in the image underneath. You can simulate this in the editor as soon as you start creating an image it will be displayed in the Micro:bit on the screen. Click on download and a hex file will be downloaded to your computer, usually in the Downloads folder on Windows systems. Drag this into the Micro:bit drive that appeared earlier when you connected your device to program device. You should now see the same pattern on your Micro:bit. It is simple to make a blinking effect with a couple of new blocks. Now add a clear screen block which can be found in the Basic section you should create something like the image below. You can alter the rate the LEDs flash by changing the pause values, the shorter the delay the faster the flashing. You can also use the clear screen block to achieve a similar affect, here is an example of this. 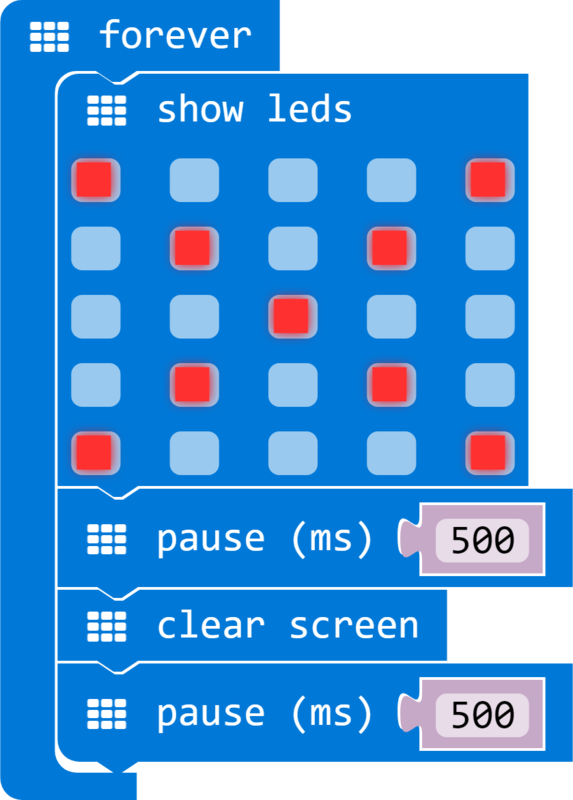 Download the hex file and copy it to your micro:bit, if you look at the led matrix you should see the text scrolling across it. A slight adaptation allows you to display more than one icon, you simple need to put a pause between each icon that you want to display. In the example below we use the no and yes icons. Download the hex file and you should see image on the led matrix change. There is another way you can flash an LED on the matrix and that is by using the toggle block, this block uses an X and Y co-ordinate system. So as an example the numbers 0 , 0 will be the led in the top left corner of the matrix. In the example below we flash the LED in the middle of the matrix and we use the pause block to alter the flash rate. So there we go we have shown you 6 different ways of displaying icons, images, text and flashing LEDs on your Micro:bit.